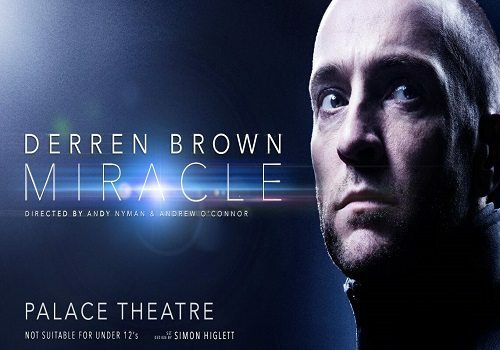 Derren Brown brings his latest show, Miracle to the Palace Theatre in London in his seventh stage show to date. Following on from the Olivier Award winning shows Something Wicked This Way Comes (2005-6) and Svengali (2011-12) Miracle is set to wow audiences in true Derren Brown style. In his most philosophical show to date, Miracle will explore the theory of happiness, examining what it is exactly that makes people feel joy. Derren Brown shot to fame in the early 00’s with his impressive Mind Control television series. Since then he has becomes synonymous with the power of psychological manipulation and illusion. Brown has played Russian Roulette on Live Tv, he has convinced upstanding citizens to commit armed robbery, hypnotised a man and convinced him to assassinate Stephen Fry, predicted the National Lottery and more! Once again Derren Brown will collaborate with Andy Nyman, also a magician and actor who co-created Ghost Stories. The pair have worked together on Brown’s television shows, including Derren Brown: The Heist, as well as three previous stage shows including Something Wicked This Way Comes, Enigma and Svengali. Nyman will co-direct the show with Andrew O’ Connor. Derren Brown has claimed that his latest show will be an “extraordinary voyage” and promises it will be one of his boldest shows to date. 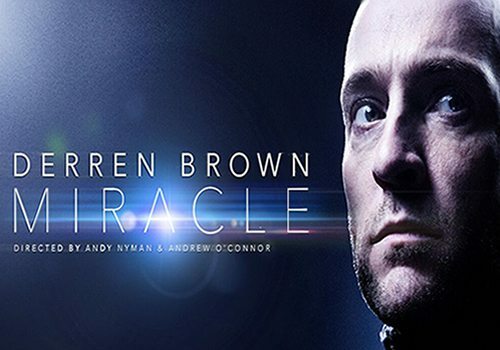 Derren Brown : Miracle has clearly stated that the show is not suitable for young audiences. Children under the age of 12 cannot attend the show.